We've said it before and we'll say it again: what would we do without Trader Joe's? We know Trader Joe's isn't a person, but seriously, it's topping our list of most reliable relationships in 2019. Whether it's collagen powder, healthier pizza crusts, or all the other yummy items, we can always count on Trader Joe's to help us stay healthy without taking all our money. 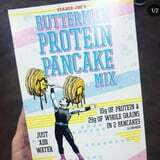 Right when we thought it couldn't get any better, Instagram user @traderjoeslist shared that TJ's is now selling buttermilk protein pancake mix. One word: yum! If you're salivating but are also like, "I can't cook," it's all good. Making the batter is foolproof, since all you have to do is add water. Plus, there's 10 grams of protein and 29 grams of whole grains per every two pancakes. We're ready to get the griddle hot! We're dreaming of pancakes topped with fresh berries, syrup, some bacon on the side, and if we're feeling extra top chef, some scrambled eggs. Honestly, the options are endless when it comes to delicious, protein-packed pancakes. You know the drill, especially if this made your stomach growl. It's time to head on over to your local Trader Joe's and stock up, because this mix is definitely going to sell out fast! Teva Pharmaceuticals' lifesaving product is also the first generic naloxone nasal spray approved for use by people without medical training. There was already a brand-name spray (Narcan) for emergency use by untrained people, such as family members and bystanders. The need is urgent. On average, more than 130 Americans die every day from overdoses of opioids -- including prescription painkillers such as fentanyl, oxycodone (OxyContin), hydrocodone (Vicodin) and morphine, as well as illegal drugs such as heroin or drugs sold as heroin, the FDA said. "In the wake of the opioid crisis, a number of efforts are underway to make this emergency overdose reversal treatment more readily available and more accessible," said Dr. Douglas Throckmorton, deputy center director for regulatory programs in the FDA's Center for Drug Evaluation and Research. "In addition to this approval of the first generic naloxone nasal spray, moving forward we will prioritize our review of generic drug applications for naloxone," he added. When someone overdoses on opioids, breathing may become shallow or stop completely, leading to death if no one intervenes. If administered quickly, naloxone can counter the effects within minutes. Throckmorton said in an agency news release that the FDA is also helping drugmakers pursue approval of an over-the-counter naloxone product, and "exploring other ways to increase availability of naloxone products intended for use in the community." "All together, these efforts have the potential to put a vital tool for combating opioid overdose in the hands of those who need it most -- friends and families of opioid users, as well as first responders and community-based organizations," Throckmorton said. 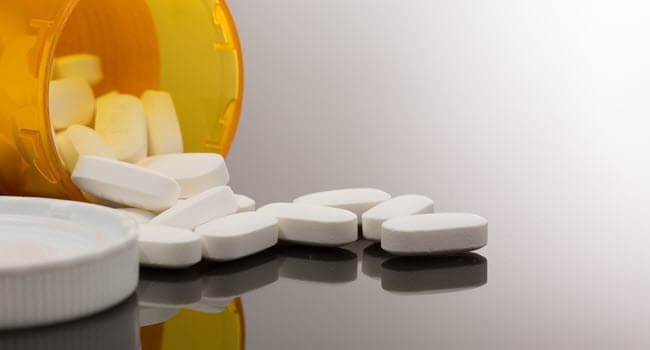 Nearly 400,000 people in the United States died of opioid overdoses between 1999 and 2017, according to the U.S. Centers for Disease Control and Prevention. "We're committed to working with other federal, state and local officials, as well as health care providers, patients and communities across the country to combat the staggering human and economic toll created by opioid abuse and addiction," Throckmorton said in the news release. If losing or managing your current weight is a goal of yours, you're going to want to double-check if you're hitting your daily fiber count. Maybe you're not feeling satisfied after your meals. Maybe you find yourself back in the kitchen an hour later making another snack or dish. By getting the recommended amount of fiber of 25 to 30 grams a day, you'll feel full for longer. A lot of fiber bars are filled with tons of sugars and other additives, so we suggest you skip all that and make one of these 18 high-fiber recipes. Just like workout clothes and sneakers, yoga mats can wear out after a while. 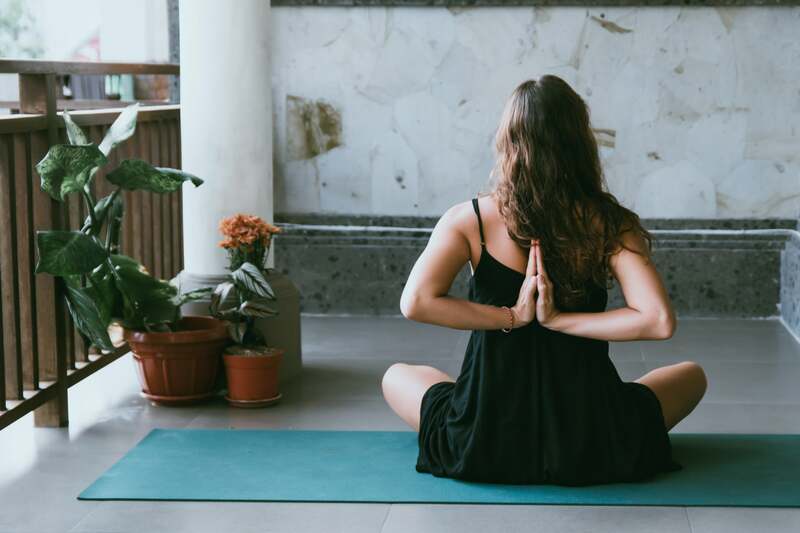 You might notice yours becoming slippery or uneven - two words that should never describe a surface on which you routinely hold poses that require balance and flexibility. But before you toss out that old mat, you might wonder: is it recyclable? "Most mats are made of PVC, which is a type of plastic that's very difficult to recycle," explained Kaméa Chayne, a Duke-certified integrative health coach, curator of ConsciousFashion.co, and host and producer of the sustainability podcast, Green Dreamer Podcast. "Not every recycling facility is capable of recycling PVC, so people looking to dispose of them would have to check with their local recyclers first." Likewise, if your mat is made from TPE or another synthetic rubber, it may be recyclable, but you should check with the experts first to be sure. Other brands use neoprene in yoga mats - for example, SUGA repurposes neoprene wetsuits to make its mats, which can then be recycled depending on the facility or returned to the brand and handled for you. (You might check to see if the manufacturer of your own mat offers a take-back program.) Have a mat that's made from natural rubber, cotton, or jute? "As long as they don't have synthetic materials mixed in with them, they are biodegradable," Kaméa told POPSUGAR. Use them as non-slip carpet backings. Cut yoga mats into squares to use as outdoor seating when you don't want to get your bottom dirty. Donate undamaged mats to charities that serve people who will make use of them. I'm a huge fan of weightlifting, but I also know the importance of giving your body a rest. Some days, that means doing nothing. Other days, it's trading in the barbell for a fun, upbeat cycling class, or going to yoga and stretching out your tight hips, hamstrings, and shoulders. If you're feeling like you need to give your muscles a break from the heavy weights, but want to fit a quick sweat sesh in, I've got exactly what you're looking for: this total-body bodyweight workout. It won't take long to do, and it's guaranteed to make your muscles quiver. Give it a shot the next time you're in a time crunch or not in the mood to get out of your pajamas and head to the gym. Before every workout, you've got to warm up your muscles so that you don't get injured. Here's a dynamic warmup I like. Once you're nice and warm, it's time to get started. You don't need any equipment, but if you're doing this workout on a hard floor, you may want a yoga mat to cushion your hands and knees. This workout should be performed as a circuit: complete one set of each exercise before moving to the next exercise, taking little to no rest in between moves. Once you've finished one round, take one minute of rest. Repeat for a total of three rounds. For a detailed explanation of each exercise, just keep on reading. As a milk-hater, I love the fact that alt-milks seem to be taking over. 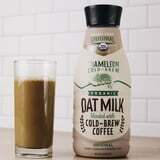 I also love Chameleon Cold Brew, so I was thrilled to hear Chameleon's plans to launch a new Oat Milk Cold Brew that offers the taste of creamy coffee without any dairy. The chilled beverage is a blend of strong cold brew and organic oat milk with some sugar for sweetness (a reasonable nine grams per 12-ounce serving). It's like those bottled lattes you've probably seen on shelves for years, but it's finally an option made with oat milk - one of the year's trendiest ingredients. I got an early taste of the new product ahead of its launch in late April, and it was honestly better than I thought it'd be. I'm a black-coffee girl at heart, so even though I don't drink milk, I usually don't add any dairy-free creamer either. But this strikes the perfect balance of bold - it still tastes like coffee - and smooth. Oat milk has a creamier mouthfeel than almond or soy milk, and a cup of it actually offers 35 percent of the recommended daily allowance for calcium. There are two Chameleon Oat Milk Cold Brew options: Original and Dark Chocolate, the second of which won't launch until May. I'm a big fan of the original, but if your go-to order is a mocha, definitely try the richer chocolaty version. The cold brew comes in a 46-ounce bottle for $7, so it's the kind of thing you can use in the morning all week long. I personally enjoy pouring a glass and sipping it while I'm getting ready before work to get the caffeine going. This exciting stuff from the Austin-based company is launching nationwide at Whole Foods on April 22, so add it to your shopping list and fridge! Last Fall, Enlightened Ice Cream introduced its first-ever line of vegan cartons in seven flavors like Ooey Gooey Cinnamon Bun and Triple Shot Espresso. Now, the line is going spoon-less. Dairy-free Enlightened bars will come in five varieties: Salted Caramel, Mint Chip, Mocha Chocolate Chip, Monkey Business, and Peanut Butter & Jelly. And here's the best part: they're all 100 calories or fewer! The calorie count for most is just 90. The bars are made with almond milk, and these flavors sound self-explanatory (and delicious). For reference, Monkey Business features dairy-free banana ice cream, peanut butter swirl, and chocolate chips. And if you were wondering what kind of jelly is in Peanut Butter & Jelly, it's raspberry jam. Starting April 22, you can find these vegan pops in stores at Albertsons, Safeway, HEB, ShopRite, and Sprouts, and they'll be popping up in other supermarkets soon. You'll also be able to find the new bars online at icecreamsource.com. A spokesperson told POPSUGAR that each box of four costs $5.99, and while Enlightened isn't planning on launching more dairy-free bars this year, it'll be listening to customer feedback. So if you're in love, make it known. Shout from the rooftops! Post a Twitter thread all about your favorites! We can't wait to get our hands on these. Ahead, check out the full nutritional info for each flavor. April 22, 2019 -- The first medical device to treat children with attention-deficit/hyperactivity disorder (ADHD) has been approved by the U.S. Food and Drug Administration. The device delivers a low-level electrical pulse to areas of the brain linked with ADHD symptoms and is approved for treatment of children aged 7 to 12 who are not on medication for ADHD, CNN reported. Treatment with NeuroSigma's Monarch external Trigeminal Nerve Stimulation System (eTNS) is by prescription and must be monitored by a caregiver. "This new device offers a safe, non-drug option for treatment of ADHD in pediatric patients through the use of mild nerve stimulation, a first of its kind," Carlos Pena, director of the FDA's Division of Neurological and Physical Medicine Devices, said in a statement. In a clinical trial of 62 children, those who used the device had statistically significant improvements in their ADHD symptoms, compared to those who received a placebo, according to the FDA. NeuroSigma's website says the device is not currently covered by insurance and could cost just over $1,000 for the starter kit, CNN reported. "Although this is a small proportion of sudden unexpected infant deaths, many suffocation deaths can be prevented," said study author Alexa Erck Lambert. She is an epidemiologist at DB Consulting Group in Silver Spring, Md. In 1999, six such deaths were recorded. In 2015, that number rose to 23 babies, according to background information in the study. The authors noted that the rise in these deaths may be due to more precise definitions of causes-of-death. They added that current statistics may underestimate the problem. For the new study, the researchers reviewed more than 1,800 infant deaths in a database of sudden unexpected infant deaths (SUID) from 2011 to 2014. In all, 250 babies -- 14% -- died from suffocation. The cause of 69% of these deaths was soft bedding. And almost all -- 92% -- of the babies who died from suffocation on soft bedding weren't sleeping on their backs. They were found on their side or on their stomach. Nearly half were in adult beds when they died, according to the report. Pillows, blankets and couch cushions were cited as types of soft bedding that contributed to these deaths, the researchers noted. Nineteen percent of the suffocation deaths were due to "overlay." That means someone was on top of the infant when the baby died. Most of the time it was a parent, but in 22% of overlay deaths, a sibling was on top of the baby. The remaining 12% of infant suffocation deaths were attributed to "wedging." This is when a baby gets wedged between a mattress and another surface. Half the time, the other surface was a wall. In roughly one-quarter of cases, it was the bedframe. Three-quarters of these deaths occurred in an adult bed. Nearly half occurred when a baby was sleeping with another person. Dr. Maryann Buetti-Sgouros, chair of pediatrics at Northern Westchester Hospital in Mount Kisco, N.Y., wasn't surprised by the findings, but she did express frustration. "These are all deaths that were preventable; these were unnecessary deaths," she said. Some parents tell her they feel better if their baby is close so they can respond if he or she needs something. "Or, some parents feel their baby is advanced enough to be able to sleep on their stomach, because they saw the baby roll over once," she added. But the study found almost 90% of babies between 0 and 4 months of age, and nearly 70% of infants from 5 to 11 months who died of suffocation were found on their stomachs. "It's just not worth the risk," Buetti-Sgouros said. She urged parents to follow the American Academy of Pediatrics' (AAP) guidelines, which recommend babies be placed on their backs to sleep. AAP recommends that infants sleep in the same room with parents for the first 12 months of life -- but not in the same bed. Buetti-Sgouros said it's fine to have the baby's crib in your room, so that the baby is still close. Put baby to sleep on a firm sleep surface. Keep pillows, bumpers, blankets and soft toys out of the baby's sleeping area. Erck Lambert said it isn't clear from this study why some parents continue to put babies to sleep on their stomachs, or let them sleep on soft surfaces. But she hopes the findings will help "better target prevention efforts." The findings were published online April 22 in Pediatrics. Someone recently asked me about getting frustrated when they feel overloaded, and then shutting down or lashing out. This probably sounds familiar to some of us. We feel overloaded, and then maybe lash out at someone in frustration and anger. This comes from the hope that things will be calm, orderly, simple, solid, and under control. The world doesn’t comply with this hope, however, as it is chaotic, disorder, constantly changing, never fixed, groundless. So we get frustrated, angry at others, and feel anxiety. So how do we deal with the frustration that arises? How can we create a habit of calm? I’m going to share a series of practices that you can turn into habits. When you notice yourself feeling frustrated, instead of lashing out, practice the following. If you practice them over and over, whenever you notice frustration, you will start to shift. The first practice is to catch your habitual pattern as early as you can, and shifting by not allowing yourself to indulge in it. When you notice yourself getting frustrated and feeling overloaded, notice the urge to go to your habitual pattern (shutting down or lashing out), but pause instead of indulging it. The next practice is to drop into the body. Again, pause, and let yourself take a breath. Drop your attention into your body and notice the sensations of frustration and overwhelm. Stay with these sensations, with curiosity. Notice how strong the urge to lash out feels, and just savor that strong feeling instead of acting on it. Open up to it, relax around it, be with it. Love this feeling, if you can, or at least be compassionate with it. Once you practice this, you get more and more comfortable being in the middle of frustration, and you don’t need to relieve the feeling by lashing out. You now have more space to calm yourself and do the next practice. The third practice is to use this newfound space to connect to the other person. Now, I understand that you might be angry at them, and so connecting to them is the last thing you want to do. Your heart is closed to them, because you think they are the problem. The problem is your closed heart. Try not indulging in that shutting down, and opening yourself a little. This is a challenging but transformative practice. From this place, notice the other person — they are acting the way they’re acting because they are feeling some kind of pain themselves. Maybe they’re feeling insecure, anxious, worried about the future. Maybe they are hurt by something you did and are themselves lashing out in frustration. Well, you can understand that! You are feeling the same thing. In this way, the two of you are connected. Maybe you’ve responded to their frustration with frustration of your own. Now you are suffering like they’re suffering. You are connected in this way, the same. Let this sameness open you up to them, understanding them in a more human way. They are not the problem, they are suffering like you are. You’re in this together. Now how can you work on this together? The final practice is to try to find an appropriate, loving and compassionate response. You have empathized with the other person, but now you need to take action. The answer of what action to take is not always easy, but at the very least, you’re not responding from a place of anger, which is a place that gives rise to inappropriate responses like lashing out. The other person is upset and going through a hard time, so you help them calm down, listen to their frustrations, offer empathy and compassion, and talk through a solution together. The other person acted inconsiderately but perhaps was unaware of how that affected you, so you come to them when you’ve calmed down and talk to them compassionately about it, sharing the impact of their actions on you and asking calmly for a specific thing they can do in the future instead. The other person is not willing to engage in a compassionate dialogue, and is set upon being a jerk. You can’t talk to them calmly, because they argue with everything. In this case, you might get a third party to mediate, like a couple’s counselor or a manager in your workplace. The other person is abusive. You empathize with the pain they must feel in order to be like this. But you also remove yourself from the situation to protect yourself from harm. You try to help them get the help they need while being firm about your boundaries. As you can see, there are many possibilities — many more than I can list here. These are just some examples to show that you can find a loving, appropriate response to the situation if you come from a place of compassion and calm. In the end, this stuff takes a lot of practice. But it’s immeasurably more helpful to do these practices than to lash out, which hurts not only the other person, but yourself as well.